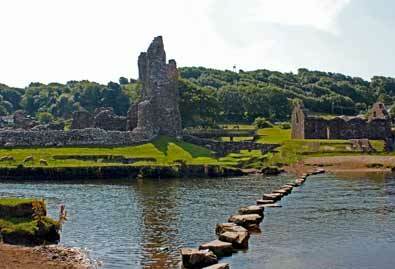 Places to Visit in Wales: Ogmore Castle, Vale of Glamorgan. 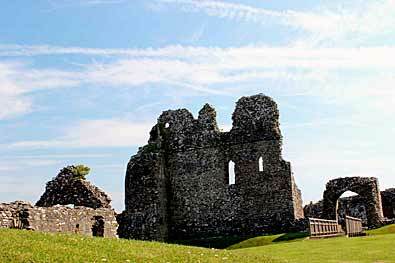 Ogmore Castle is situated in St. Bride's Major, Vale of Glamorgan on the east bank of the River Ogmore and south of the River Ewenny. The castle stands at what was once a strategic position to protect the towns of Bridgend and Coity situated further inland to the north and east. 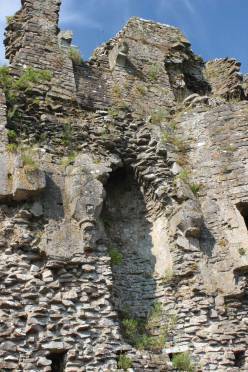 Old Fire Hearth, Ogmore Castle. reinforced by stone and when looking up inside the Great Hall, the remains of the upper first floor can be seen with a large and ornate fireplace and arched windows. The Castle is thought to date back to before the Norman Invasion but was given to William de Londres by Robert Fitzhamon who was the Norman conqueror of Glamorgan. In 1116, whilst William was away, his butler Arnold successfully defended the Castle against a Welsh invasion, and was later knighted, Sir Arnold Butler and given Ogmore Castle along with the nearby Dunraven Manor as a reward for his bravery. The legend goes that a local man once accosted the White Lady - the ghost of Lady Ogmore - demanding that she give him some gold that he knew she had hidden in the castle. She led him upstairs into the one of the towers and beckoned him to raise a large stone slab from the floor. There under the slab, was a container full of golden guineas. She told him that he could take half but leave the other half for her. He accepted her offer and left with his windfall. Later on though, he was overcome by greed and couldn't see why he should not have the entire fortune. After all, what would a ghost do with such a worldly fortune anyway? So he returned to the castle get it. As he was about to take the money, the ghost caught him in the act. He tried to talk his way out of it, saying that she was mistaken and that he was only checking on it. But the White Lady knew that theft was in his heart and set about him, slashing deeply into his flesh with her talons. 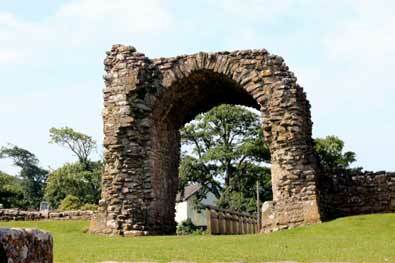 He left Ogmore Castle bruised, bloodied and badly injured but made it home. There was a lot of questioning as to how he got these bruises and he must have confessed to the truth just before he died of his wounds because his sickness and subsequent death was referred to as the White Lady's Revenge.